On Sunday, October 29, 2017, at the 10:30AM Eucharist, Suffragan Bishop Nedi Rivera of the Diocese of Southern Ohio presided, preached, and consecrated our new Nordlie Opus 27 organ in memory of Stanley Paul Ferch. The Nordlie organ, which is described in some detail on the Music page of the Holy Trinity web site, was the culmination of eighteen months of work by a select committee charged with discerning the state of the previous Wicks organ, determining whether to renovate, repair, or replace it, and studying the architectural, acoustical, and aesthetic context of the church building along with the culture of music in the liturgy and cultural life of Holy Trinity parish and the town of Oxford, Ohio. The pictures below suggest some of the spirit and joy of the congregation and community expressed in this Consecration service. The acolytes, choir, lay ministers, priest and Bishop gather in the Narthex before the procession enters the church. 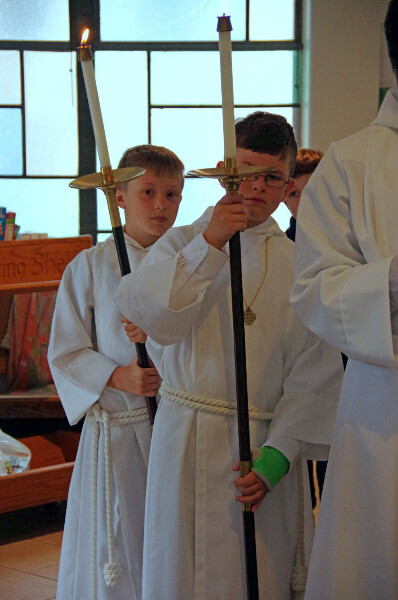 When the Gospel is read, a Lay Eucharistic Minister carries the Gospel Book into the congregation, led by a Cross and two Torches. The Gospeler reads the Gospel and then the procession returns the Gospel Book to the altar. When the organ is consecrated, Bishop Rivera censes the organ cabinet and key desk. Later, she censes the altar before the consecration of the bread and wine for Holy Communion. 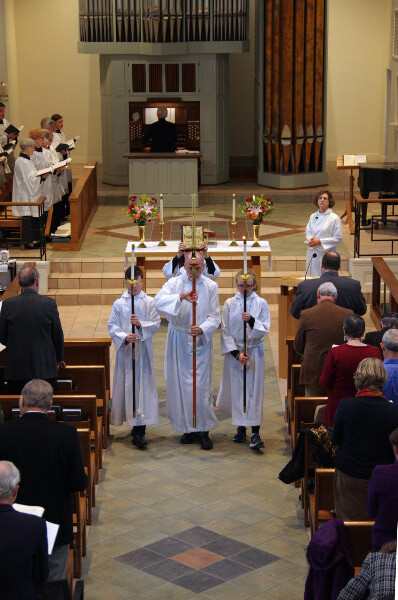 After the altar is censed, the Thurifer (who carries the thurible or censer) censes the congregation. Incense is a symbol of prayer, the Holy Spirit and the presence of God in our midst. Music is offered by the choir and the organist as well as sung by the congregation. After the Consecration Eucharist, the congregation gathers in the Undercroft (Lower Level) for a festive Coffee Hour and Ice Cream Sunday bar. Children occupy themselves with carving pumpkins for Hallowe'en, just two days later (followed by a Hayride and Bonfire on November 4 at Butterfield Farm, 4-6-PM). Bishop Rivera checks out the pumpkin carving being done by two Holy Trinity youngsters. Opposite: carving commences after the pumpkins are emptied of their seeds.